If you just want to slow down and relax, the deck is a good place to sit and watch the sunset. You can walk mowed trails on the property and enjoy nature. You may see deer, turkeys or a number of other animals. You can pick wild blackberries in season. You can sit on the deck and watch the Amish farmers work the fields. Have a cook out with the gas grill and then sit around a campfire and watch the stars. In the fall when the trees turn colors is a great time to enjoy Hill Country Haven. Homeaway travelers gave Hill Country Haven 47 five star reviews! For those who want to get out of the typical Holiday/Quality/Super/Comfort/ BW hotel stay, we highly recommend this place. Comfortable little house with a gorgeous bedroom, views to die for and the convenience of a little kitchen to prepare meals in. Especially appreciated the a/ on a 93* day and night!! Thank you Loren and Denise. 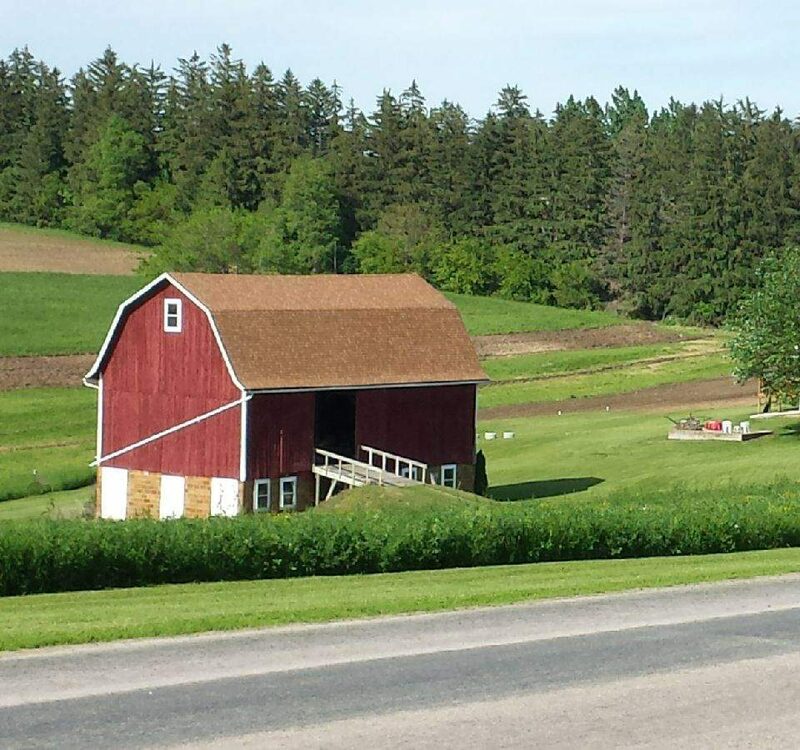 We enjoyed this gorgeous rural section of WI. Lots of wineries, bike trails and the House on the Rock was much more than expected. Lovely view and deck and perfectly comfortable farmhouse. Clean and had everything we needed. Very friendly hosts. We hope to return! This place exceeded our expectations. Super clean and all the conveniences. The Erickson's are very friendly and helpful. Their mile of trails made a great short run or walk. The bike trail in Hillsboro made for great running and biking. The Hillsboro lake was good to swim in. Highly recommend! We thoroughly enjoyed our stay here with our Black Lab. Love the setting and central location to many state parks, Amish country etc. Well equipped for cooking all meals on location yet close enough to town you can conveniently go out for the local flavor. Trails and generous property were perfect for morning and evening walks or letting our dog explore on his own. This was our 4th visit to the Hillsboro Farmhouse and I am still in love. It's so wonderful to be able to relax in a place so beautiful and peaceful. When we come to the farmhouse we call it our doggies' vacation...I love being able to take them somewhere they can run, play, and explore. They are worn out on the drive home. For us, we love the charming and historic farmhouse set on the serene rolling hillside. I enjoy sitting on the porch listening to the birds while the dogs run in the huge yard. Hubby is not as much of an outdoorsy person as I am, but I think even he appreciates relaxing, watching TV, and just unwinding away from the rat race of Chicagoland and Illinois. It's great to grill dinner and have a fire at dusk. I hope we get to continue to come up to the farmhouse for many years to come. Thank you for the hospitality and sharing your family's historic homestead with us Loren & Denise! The farmhouse is really a fantastic, peaceful place to stay. It's been in the owner's family for over 100 years, and the pride of ownership in the property really shows. The deck and rear portion of the house have a lovely view over woods and farm fields. Many of the farmers in the area are Amish, and it's really cool to see all the various Amish buggies and wagons passing on the road in front of the house (which has very little traffic). We've already booked another stay in June. Thanks, Loren and Denise! Being in the Amish countryside for four nights away from the world of technology and the rush was a Godsend for us. There is a lot to be said for an escape that feels like you are transcended back in time that can be so healing for the soul. I thank Loren and Denise for providing such a great haven for my husband and myself, and also for welcoming our six year old pug as well. We felt welcomed by their warm hospitality from the moment we arrived in this clean and comfortable home. While there we sat on the deck enjoying the quiet, walked the trails a few times, and enjoyed a breakfast at Barbie's place and a dinner at Beezer's Bar & Grill. The food was good and the restaurant patrons struck up an easy conversation with us. We highly recommend it to anyone wanting a quiet, relaxing place to stay. It was a perfect escape for us! Wow, this farmhouse exceeded our expectations. We slept more here than we have ever slept anyplace else. The farmhouse is bigger than it looks. The bedroom, oh the bedroom is so beautiful. What a view. Comfortable bed and a breeze that should be bottled. Mr. and Mrs. Erickson couldn't have been any nicer with places to go and ideas of things to do. We have already booked two more trips this year because of the location of this house. Do yourself a favor and book a stay here. This place will really put your life in perspective.